Miranda IM is a multi-protocol instant messaging client for Windows. This venerable instant messaging client has recently added support for Facebook Chat making it even more attractive. Miranda IM is based on a powerful plugin-based framework and has over 350+ plugins available making it one of the most flexible and infinitely customizable instant messaging clients around. Miranda has now added Facebook Chat and you can connect to Facebook using the Jabber protocol. 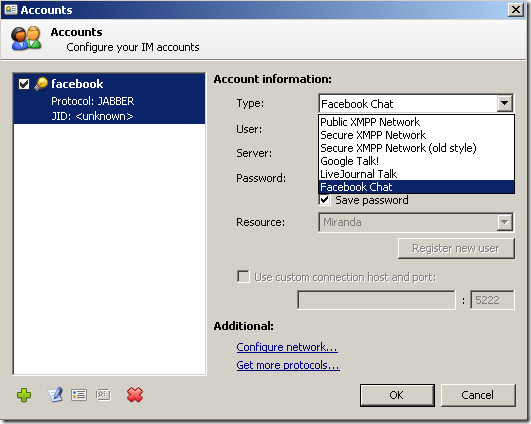 Just create an account with Jabber protocol and you will see an option to choose Facebook Chat. With Facebook recently enabling XMPP server for public 3rd party clients use, you can look forward to more Facebook specific features shortly. Plus, Miranda IM is also available as a portable download and it is heading to our top portable apps collection for sure.